Though the name may seem odd and beside the point, it’s important to a case’s timeline. If a case is declared “complex” it will give the defense more time to review discovery submitted by the prosecution, postponing the currently scheduled July 18 trial. Bosch and Short told Judge Shirley that they had only begun to scratch the surface of the voluminous discovery turned over by the government. Moreover, for them to do their jobs properly they’ll need additional time to review everything and properly brief their client. They state that the July 18 date currently set for trial is inappropriate given the amount of work still left to do. The defense counters saying that the investigation against their client was continued by the TBI after the plea deal was accepted and that, as a result, mountains of new information remains to be reviewed. Interviews were conducted and filed were gathered, none of which were available the first time around. It was announced later last week that Judge Shirley approved a deal struck between the two sides granting a three-month continuance, so that trial is not set to begin until October 23rd. This amounts to a victory for both sides. The defense received a delay and longer time to review and prepare their case. The prosecution avoided having the trial labeled “complex” and kept the case subject to the federal speedy trial act. Though Baumgartner pled guilty to avoid further prosecution just like the one currently proceeding, further allegations of misconduct that he was not initially charged with have since been unearthed. These include his doctor shopping, using his mistress (one of his own Drug Court graduates, Denna Castleman) to get pills, using his influence to help her avoid trouble with prosecutors and judges, lying about being her lawyer and helping her hide a failed drug test. His actions with Castleman are at the heart of the current federal case filed in May. Baumgartner is currently charged with and scheduled for trial on July 18th for seven counts of misprision of a felony. Each count accuses him of either covering up Castleman’s crimes or failing to report them to the proper authorities. Misprision of a felony carries a maximum prison term of three years. Yet another interesting twist occurred earlier last week when, on Wednesday, U.S. District Judge Thomas Phillips, who was scheduled to preside over Baumgartner’s trial, recused himself. Phillips has not released any word as to why he asked to have the case reassigned and the decision now rests in the hands of Chief U.S. District Judge Curtis Collier to assign Phillips’ replacement. 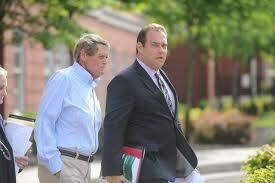 Source: “Baumgartner seeks delay in his federal trial,” by Jamie Satterfield, published at KnoxNews.com.